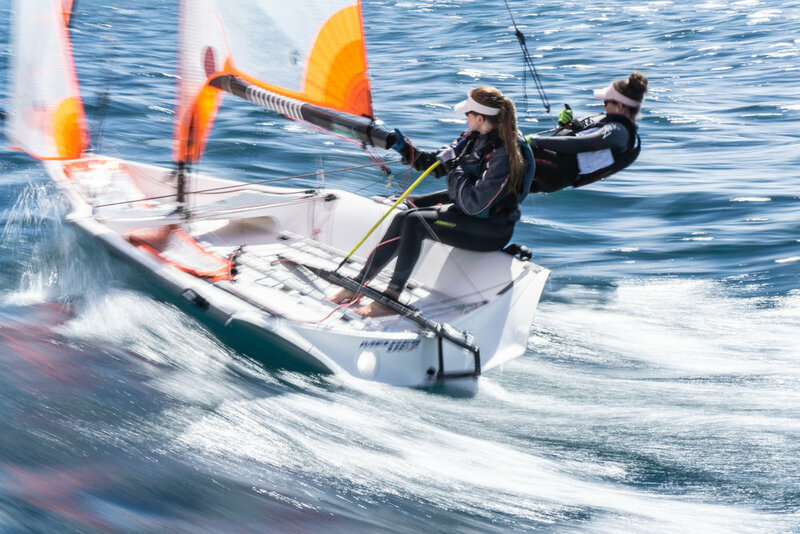 California has been a hub for skiff sailing since the first 29ers were brought to the US, but we’re in a rebuilding phase right now, and there’s a lot of work to be done to get back to the top of the fleet! One of the keys to success is getting the top talent together from around California to push each other, and to raise the bar in everything from technique to training approaches. This weekend was a good step forward, and it’s exciting to see so many enthusiastic young teams getting involved in the class. This debrief will focus on a few major takeaways from the weekend to help you keep making progress in the next few weeks until we can do it again! In the skiff classes more than any other class, nailing down good fundamentals before ratcheting up the difficulty is key, as there is such a huge difference between good maneuvers and great maneuvers in these boats. To play the game, you need to develop the tools, and that starts with knowing your footwork and handwork forwards and backwards. We did quite a bit of tacking and gybing in a range of breeze this weekend, and saw some great maneuvers, but there is still refinement to do for everyone. If you’re new to the mechanics check out this playlist, about 29er maneuvers. Whether you’re new to the mechanics or a veteran, take a look at the boat handling videos from the weekend, and do a little technique dissection. How was the handwork? Footwork? Was the boat stable through the maneuver or did the movements shake the rig around in a lot of unnecessary movements? Was the turn in sync with the weight? Was the sheet in sync with the turn? You’ll get way more out of this debrief if you actually do the analysis yourself rather than me giving you all of the answers! What goes into a good start? When people think about starting practice, the number one thing I hear teams talk about is acceleration on the starting line. How fast can you get from parked to full speed? Undoubtedly this is an important skill to work on, but there are many other factors that go into starting, which I would actually argue are more important than the mechanics of the acceleration itself. Time-distance drill: Set a watch for two minutes, and get into position 1:30 from the starting gun. Try to pick a spot where you think you’ll drift down onto the boat end or the pin end just in time to pull the trigger in the last few seconds and start right next to your mark. Fight to avoid sliding for the final minute and thirty seconds and see where you end up. Adjust your positioning and try again! AMWOT drill: Check it out here. This one is huge for mastering the down speed boat control. Two Boat Time Distance Drill: Same as the first drill, but one boat is assigned to be a windward boat and the other is the leeward boat. The goal of the windward boat is to force the leeward boat down the line without going for the hook. The leeward boat is trying to stay up the line, and eventually end up on a mark at the gun. This is a great one for practicing the tactical game. As the windward boat the goal is to stay out of phase with the leeward boat, while the leeward boat is trying to get in sync with the windward boat. Master these skills, and you’ll start to view the starting line game in a totally new way. Getting to the top is all about refining your learning process to improve faster than those around you. Figuring out how to ask the right questions is critical, and it starts by getting more specific about the questions you’re asking. Rather than targeting improvement in “steering” as a whole, we need to be digging into the details. “I want to work on the down turn at the tops of the waves, and ensuring that the boat stays loaded through the troughs,” gives you a clear target - a goal that you can come back to when reviewing video or looking at gps tracks to see if you moved the needle. Refining your focus to emphasize specifics like this is a skill that takes practice, but if you make a habit of setting daily goals, and then evaluating your progress at the end of the day, you’ll improve very quickly, and when you do you’ll see your skills respond accordingly.